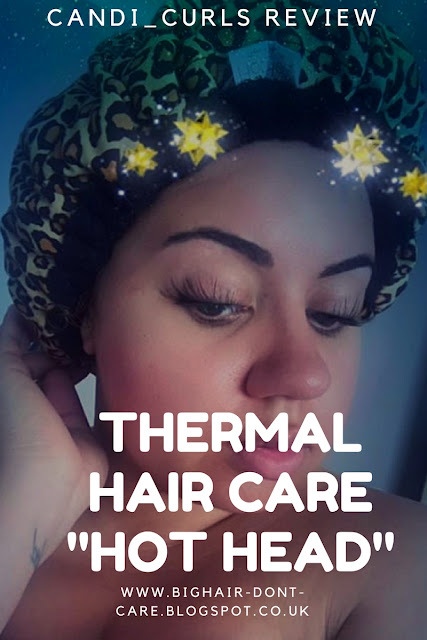 If you are active in the natural hair world on instagram, then you would have seen this heated thermal cap everywhere! Literally everyone is using it, and for good reason too. The "hot head" is a flax filled, microwavable, deep conditioning heat cap. It allows you to get salon benefits at home. No sitting under a dryer while treatments sink in, this just goes in the microwave. The heat caps come in a variety of patterns and colours, which are reversible too. Mine is leopard print, with black on the other side. You can find one to match your personality on the website, which makes deep conditioning more fun and less funny. Nothing worse than sitting for 30mins with a shower cap on your head, now you can dress it up a little. The fact that they are wireless, no sitting in one spot because you're plugged in, means that you have the freedom to get stuff done while wearing it. Clean the house, have a bath, get a face mask and pamper yourself even more. You can do it all while your hair gets a deep condition. The caps have enough heat in them to last 20-45 minutes according to the website. Simply wash hair, then gently towel dry to prevent dripping. Apply hair treatment of choice. Follow with a plastic cap, completely covering the hairline. Place Hot Head on a clean glass or ceramic plate in a 1000-watt microwave with elastic facing up. Power level must be lowered accordingly for higher wattage microwaves! Refer to your owners manual to find out how. Heat for a total of 3, 30-45-second intervals, removing your Hot Head to flip inside out and replace in the microwave at each interval. If additional heat is desired proceed in 10-20sec increments, following the above flipping method, until desired heat level is achieved. Do not exceed a combined total of 3min, from start to finish. Place heated Hot Head on head over plastic shower cap. For best results wear 20-45 minutes. Reheat for longer treatments when desired. Remove Hot Head completely at the conclusion of treatment. Allow hair to cool 5 minutes, then rinse with cold water to seal the hair cuticle. Style as usual. But what did i think of it? I had really high hopes for this cap, as well as strong doubts too. I have never used a home steamer, or hood, and was still fairly new to deep conditioning in general when i got this cap (last year sometime), but i had heard such great things. Being in the UK, i did struggle to find somewhere to get one without huge shipping costs, but i found a few places that stock them. I got mine from Simply Moi and have since found they are also available at my favourite store naturalistic products and cost around £30 including delivery. When i first used this in the microwave, i just couldn't get it right. I was told not to exceed 3 minutes, but it wasn't get hot for long enough. I put it on my head and it was so relaxing, warm and snug, i could fall asleep in it! But i wouldn't say you get 45 Min's out of it, not nearly. After using it a few more times, i now know the trick with getting it to stay warm. Make sure that when you flip the cap, you shake those little flax seeds activating them, and spreading the head. If you don't, then like i did at first, you wont get the most out of your cap. Now i know the trick, i LOVE my cap. I use it every single time i deep condition my hair, and each time i could fall asleep ha ha. It is honestly the best thing i have used on my head. You do get a good 30+ minutes out of the cap, and when you take it off, your hair is still hot meaning you can wait a little longer with the cap off and just the shower cap, and reap the goodness. It is a little heavier on your head than what i thought it was going to be, but that's because of how filled it is. It takes some getting used to when you first try it out, but it doesn't take long. I would definitely say that using this cap, makes a huge difference in the way my hair turns out after deep conditioning. I obviously can't compare it to hoods and dryers, but it is easy and comfy. The flax seeds heat up so quickly, it really doesn't take long to get this cap to work. I once had a teddy bear which went in the microwave the way this cap does. It had a funny smell once you did this, due to lavender being used inside one, and I'm not what was in the other one, and so i worried about this with the thermal cap. It thankful did not let off any bad smell at all. Its super easy to clean by hand or with a lint roller, meaning that it can be reused over and over again, and if you take care of it, it will last you a long time. This is one of my number one hair care accessories that i own and i recommend everyone gets one! !